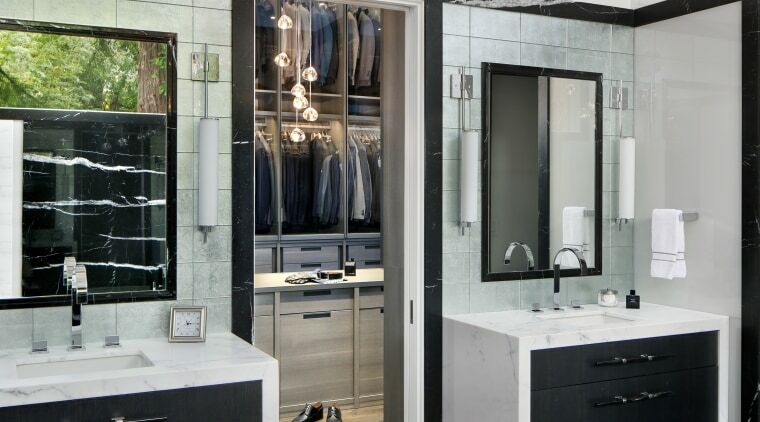 This pampering bathroom by TRG Architecture + Interior Design combines dramatic looks with crisp functionality. 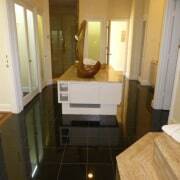 The window is framed in black marble, matching the slab behind the tub. "The owners requested an expansive closet space enough room for at least 200 pairs of shoes and a black and white colour scheme. Design challenges for Lamarre included working with the unusually tall 3.65m ceiling height and retaining the existing window with its view of a redwood grove this was the only natural light source in the room. At the same time, the modern look had to work well with the home's traditional architecture. 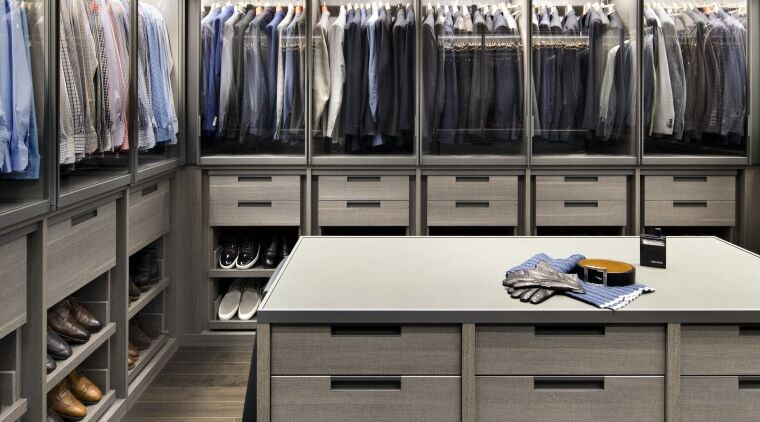 This walk-in wardrobe, and a seasonal closet nearby, together provide over 38m of hanging space and room for 216 pairs of shoes. The designer borrowed nearly half of the area of the original bathroom footprint and combined this with an under-utilised linen cupboard to achieve this closet. 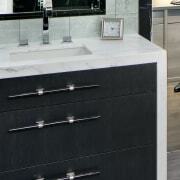 In response, the design team introduced a dramatic black marble slab to anchor the space and backdrop its focal-point the free-standing tub. The slab continues up to the lofty ceiling, visually connecting it to the floor. 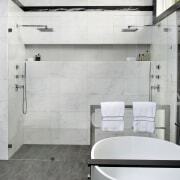 In contrast, a quiet white marble covers the wet walls. 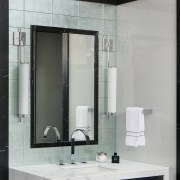 As part of a whole bathroom renovation by designer Leslie Lamarre of TRG Architecture + Interior Design, this vanity area is walled in silver-backed glass tiles with the spacious new walk-in wardrobe directly behind.